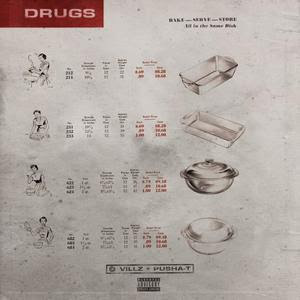 Florida singer-songwriter Villz scores a Pusha T feature on "Drugs." Villz is a singer-songwriter from Florida whose most notable project to date is the 2014 Till The End Of Summer. He returns today with a new single "Drugs" that features a lyrically exquisite verse from tha gawd Pusha T. Villz invites a potential love interest to come and do drugs with him, expertly navigates autotuned falsetto melodies like a a tightrope walker. Syk Sense and Fademajah uncork twisted harmonies that mesh well with Villz' somewhat anguished vocal bursts. Dj Smoke broke this single first on his mixtape "Smoked Out Radio 48 (Hosted By E-Reign)"
Follow Villz on Twitter @Dirtbaggvillz if you like what you hear.